Brighton & Hove Albion knew for and number of weeks that David Stockdale would be leaving the club this summer. It was announced this week that the experienced goalkeeper will join Championship outfit Birmingham City on a three-year deal when his Albion contract expires on July 1. The 31-year-old was a key-man in promotion to the Premier League last season with 22 clean sheets, conceding 40 goals in 45 appearance. 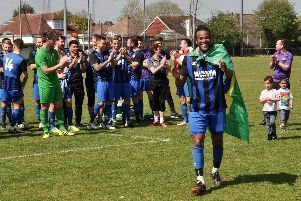 It has been a will he or won’t he saga over the summer with question marks over where he would be playing football next season after turning down a new Albion contract. For many, his destination will be a surprise, but his departure was fully expected in the Albion ranks, with chief executive Paul Barber saying the ‘writing was on the wall’ after their best contract offer was not accepted. He revealed: “It was not a surprise in terms of not reaching an agreement with David, we have known for some weeks that was not going to happen and obviously players’ choice of football clubs is very much personal thing. “You get to a point where a contract is offered and if it’s your best offer and it’s not accepted than your writing is on the wall. “We have a great relationship with David’s agent, I have know Rob Segal for many, many years and we have an open relationship and said, ‘if that is your best offer then we will have to look elsewhere’ and then it’s ‘no problems, we understand that’. “The whole process was conducted without any acrimony or any problems, we were all aware where we were at any particular time. “David will always be welcome here and part of folk law that got promotion to the Premier League.